Yamaha RX-V1065 review | What Hi-Fi? Yamaha set very high standards in the home cinema world in 2008, roughing-up its rivals with a raft of five-star multichannel amps and receivers. So far, 2009 hasn't been quite as fruitful, although the company already has a number of solid four-star reviews. Could the RX-V1065 go that extra mile? Yamaha has obviously lavished a lot of attention and man-hours on the RX-V1065. High-quality internal components and trickle-down technology from the company's more expensive models have all been implemented in an attempt to boost performance. For example, the RX-V1065 features Yamaha's ultra-low Jitter Digital Clock Circuit, used on the RX-V3900 and DSP-Z11 to help reduce timing errors through the amp's digital inputs. On the connectivity and feature front the Yamaha has a selection that fares no better or worse against its key rivals. This seven-channel receiver kicks out 105W of power, provides you with four HDMI inputs, one HDMI output, analogue video upconversion and upscaling to 1080p resolution. There's also a set of multichannel analogue inputs, a full set of pre-outs and dual subwoofer outputs. Thankfully, Yamaha has sorted out the minor issue with the amp's input assignment, or rather lack of it. You can now enjoy picture and surround sound simultaneously fed into the amp from products such as Sky+ HD, using the HDMI and digital connections. The Yamaha also sports a new GUI (graphic user interface) but this doesn't automatically make it a revelation. If anything, it's rather unintuitive and doesn't allow you clearly see all the menus and options at your disposal, thus slowing you down. We've already touched on the fact that the '1065 seems to have been handled differently from the other sub-£800 machines in Yamaha's range. And this is mirrored in the receiver's performance. We've accused cheaper Yamaha machines of lacking precision, dynamics and detail, but this machine redresses all those issues. What you have here is a very powerful, confident and controlled amp. It's a bit of a showman, and during The Dark Knight, the muscular, rousing delivery brings the viewer one step closer to the intense action. This amp places surround effects with such accuracy and creates such a fantastic spread of sound that it's more than a match for the very best examples around this pricepoint. Dialogue isn't the final word in terms of clarity, but more than adequate for the money. And it's entertaining enough in stereo with music, with decent weight and punch, despite not conveying the most fine detail available at this price level. Arguably, the Yamaha has the edge over Denon's AVR-2310 when it comes to the processing and steering of surround effects, but that lack of dialogue clarity and fine detail counts against it. 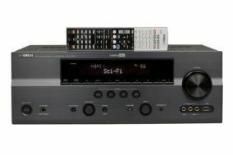 Still, this is a very welcome return to form for Yamaha and if you're in the market for a receiver at this price, you should audition it. We'll reveal our favourite receiver at this price point on our Awards microsite on October 20th.